An interview with Vincent Chui – korientation e.V. 2. In “Fig” you are apparently focusing on intersections of gender and social class in Hong Kong and Macau. Is this a topic which is included in all your works, or was this focus specifically chosen for this feature? I have made 5 features films so far. Two of them were commercial genre films that I barely controlled the themes. The other two independent films were initiated by me with an original idea. Lou had the idea of “Fig” and wrote the full script all by herself. As the director, I humbly tried to transform it into images. During the process, I guess my thoughts would assimilate into the original script unintentionally. I did concern different social classes and like to focus on women characters in my previous films. Even “Fig” wasn’t my idea, I believe that I did care about the gender and social class issue all the way. 3. Are you currently working on a new film project, if yes, what is the theme/story behind it? I am working on a script called “Full House at midnight”. It will be a romantic ghost story with a nostalgia theme about the disappearance of the old cinemas and community. At the same time, I am producing two films for two first-time directors. One is a documentary about a social activist who advocates localism. The other is a fiction about the haze of the young people after the umbrella movement. 4. You are not only well-known as an independent film director, but also as founder of the non-profit organization Ying e Chi. What was your motivation to start Ying e Chi? What are your current projects there? And how has your work there changed over the years? We started Ying E Chi 20 years ago was to aim at promoting Hong Kong independent films. We curate the Hong Kong Independent films festival every years and showing local and overseas (mainly Chinese speaking) independent films irregularly in cinemas and different venues. Due to the change of technology, we are able to participate in producing films too. We have crowd funded for 5 short films and finished a documentary (Yellowing) through a workshop in recent years. 5. Is your work as film director and representative of Ying e Chi influenced by current political developments in Hong Kong? I myself am getting a little bit fed up by the political issue. I made “Leaving in sorrow” in 2000 to capture the scene before and after the handover. I also finished “Three narrow gates” (2008) which was inspired by the protest against the bill of basic law 23 article in 1 July, 2003. After making these two films, I found myself getting too close to the political issue that I could hardly see the humanity behind it. I would rather focus on the emotion and relationship of the people in this particular moment of Hong Kong. As the representative of Ying E Chi, I like to see the young filmmakers show their concerns about Hong Kong. Besides, they sell well. However, the freedom of expression is under threat recently and it’s worth further discussion. Vincent Chui, born 1965, returned to Hong Kong after graduating from the Film School of Loyola Marymount University, and worked in film and television. 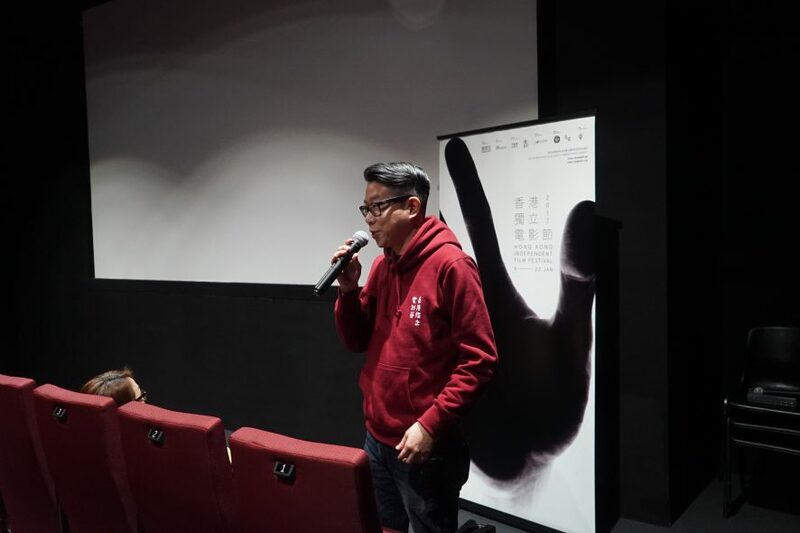 He has been involved in independent films since 1993, and founded Ying E Chi in 1997 with other independent filmmakers to promote and distribute Hong Kong independent movies. He also co-directed the documentary As Time Goes By with Ann Hui in the same year. His debut feature film Leaving in Sorrow (2001) was followed by Fear of Intimacy (2004) and Three Narrow Gates(2008). All his feature films were screened successfully at international filmfestivals.